Maximum size: 59 mm (extrapolated from shell length); usually smaller. Natural history: Bulla vernicosa is a moderately common species found in protected to moderately exposed mixed habitats and in Halimeda kanaloana beds at depths of < 1 to 15 m (< 3 to 49 ft). Dredged shells from the Bishop Museum extend the depth range to at least 183 m (600 ft). It is nocturnal, burying itself in sand or concealing itself under rocks during the day. It feeds on the green algae Enteromorpha and lays an egg mass composed of tangled, yellow strings (Kay, 1979). On Oct. 22, 1994 a tiny, orange commensal copepod was found on a large animal from Airport Beach, Maui. Distribution: Big Island, Maui and Oahu: widely distributed in the western & central Pacific. Taxonomic notes: The photo labeled Bulla vernicosa in Kay, 1979 is actually Bulla peasiana (Kay considered that species a synonym of B. vernicosa at the time). The photo in Kay & Schoenberg-Dole, 1991 is also probably Bulla peasiana. It's listed as Bulla adamsi in Quirk & Harrison, 1972, Quirk & Wolfe, 1974 and Tinker, 1958. Photo: CP: 30 mm: Hekili Point, Maui; Nov. 17, 2006. Note 1: Mykle Hoban reported on Feb. 9, 2017 that shells found on the bottom off Oahu showed strong red florescence under ultraviolet light. We subsequently confirmed the observation with a 395 nM UV flashlight. A photo by Marcel Koken of a Bulla sp. 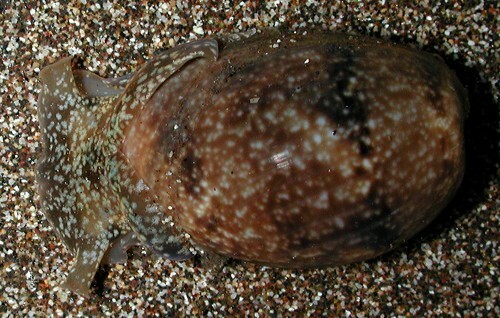 from Martinique (posted at Madibenthos) illustrates the phenomenon in the genus.